Our night at Station Square has been one of the highlights of the Herne Hill Free Film Festival every year since we launched. We wheel out the people’s piano, we pull up a screen, we set out some deck chairs and everyone sits back to enjoy an evening of live music, silent films (accompanied by Neil Brand, one of the UK’s leading piano accompanists) and short features made by local filmmakers. This year we’re bringing two classic Laurel & Hardy shorts to Station Square, Angora Love and You’re Darn Tootin’. The first is the final silent film made by Laurel & Hardy, released in December 1929, and it tells the story of a stray goat, a landlord that doesn’t like pets and a hilarious water fight involving Stan and Ollie, the landlord, a fellow tenant and a policeman. 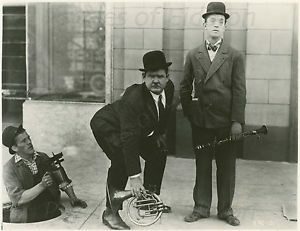 You’re Darn Tootin’ came out in 1928 and has Stan and Ollie as members of a municipal band. Long story short, it finishes with a street full of people trying to take off each other’s trousers. Comedy gold. Also screening is The Wonderful Walk, a documentary set in the very heart of Herne Hill and starring its colourful and creative community. 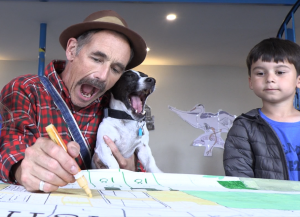 Local director Sue Carpenter follows the regeneration of Herne Hill Station underpass, culminating in the triumphant day on 12 Sept 2018 when 2,332 local residents, our local MP, two mayors, and Mark Rylance and his two Jack Russells came together to colour in a 40 metre mural, in a bid for the Guinness World Record for the most contributions to a colour-by-numbers painting.